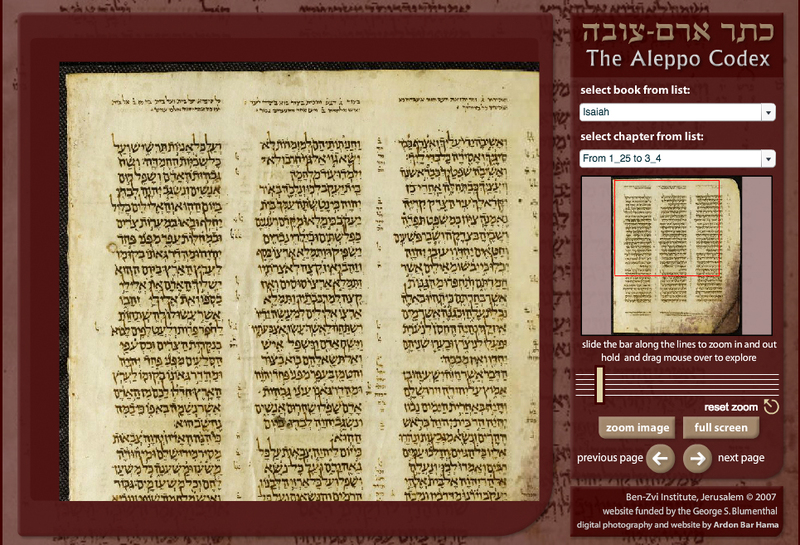 The Aleppo Codex is the oldest existing manuscript of the Hebrew Bible, written in 920 CE in Israel. It is known as the actual bible that Maimonides utilized in creating his most famous work – The Mishne Torah – which he completed in the year 1180 in Egypt. Subsequently, his descendants transferred the Codex to Aleppo, Syria where it remained until 1948, when it was smuggled out of Syria in a washing machine. Today it is displayed in the Shrine of the Book at the Israel Museum. In 2003, the Ben Zvi Institute for the Study of Jewish Communities in the East partnered with George Blumenthal and photographer Ardon Bar-Hama to photograph the entire Aleppo Codex in a quality that had not hitherto been presented. In addition to browsing the text, users can search for a specific verse and enlarge areas to see hard to spot details. The site also contains scholarly articles on the significance of this biblical manuscripts.